This NSF-funded research project aims to study electrical anisotropy in the oceanic crust and mantle using controlled source EM and magnetotelluric soundings. It is an international collaboration between the Marine EM Laboratory at Scripps Institution of Oceanography and Lucy MacGregor and Martin Sinha of Southampton Oceanography Centre, Mark Everett of Texas A&M University, and Antony White and Graham Heinson of Flinders and Adelaide Universities. The first leg of the experiment was carried out on the R.V. Thomas Thompson Feb 22nd to March 12 2001. The recovery leg on the R/V New Horizon follwed in August 2001. The CSEM data from this experiment was studied by James Behrens for his Ph.D. thesis. 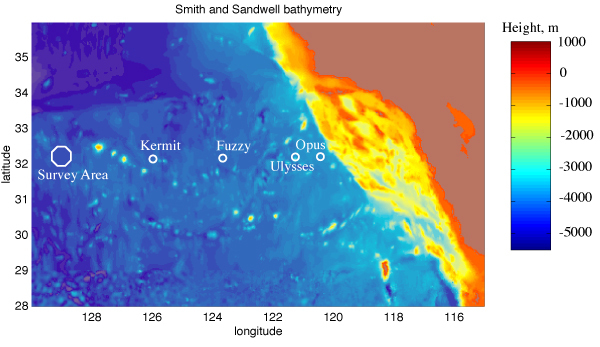 Location of the controlled-source EM survey area, about 1000 km west of San Diego, California. Four long period MT receivers operated by Graham Heinson (Adelaide University) were deployed on a transect to the mainland in order to study the EM coast effect. The survey area. Black dots show the location of EM receivers. 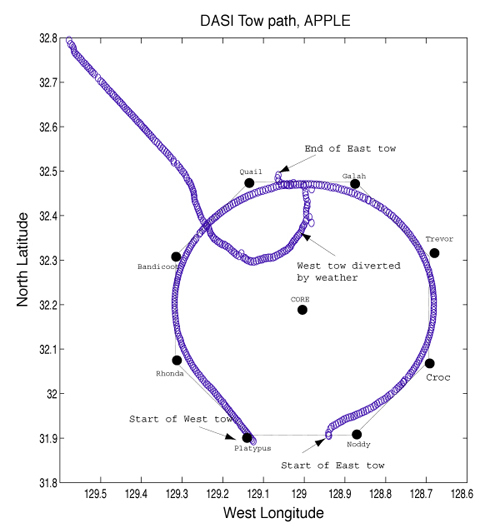 The blue trail shows the path of the deep-towed EM transmitter, which was used to broadcast energy down through the lithosphere and back up to the receivers. The core location consisted of 4 LEM receivers, which record electric fields on 100 m long dipole antennas. 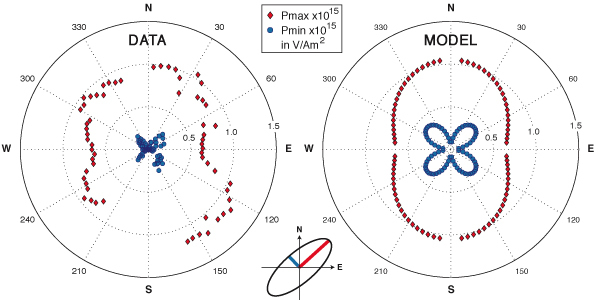 Initial evidence for anisotropy: Magnitudes of the major (Pmax) and minor (Pmin) axes of the elliptically polarized horizontal electric field for CSEM data (left) and model response (right) as a function of receiver–transmitter bearing on the large circular tow. The model is a uniaxially anisotropic upper mantle underlying an isotropic crust, with vertical sheets of increased electrical conductivity aligned N–S, parallel to the paleo-spreading center. The two resistivities in the anisotropic layer are 10,000 Ohm.m and 100,000 Ohm.m.